I’ve never picked this chocolate shop to satisfy my cravings, until now. I got the Italian Cookie Ice Cream, and it was crazy good with a melty chocolate ribbon going through it. Bonus points: you also get a free truffle. One of the few places around where you can get soft serve with an Asian twist, my favorite’s the Black Sesame. 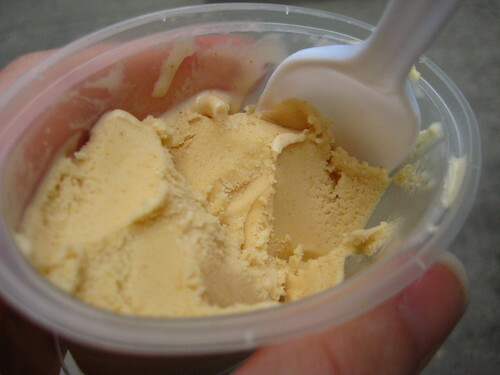 They now offer Kinako, made with soybean powder, and little servings of hard ice cream. Your best bet is to let this sucker melt a bit or you’ll be flinging ice cream all over. 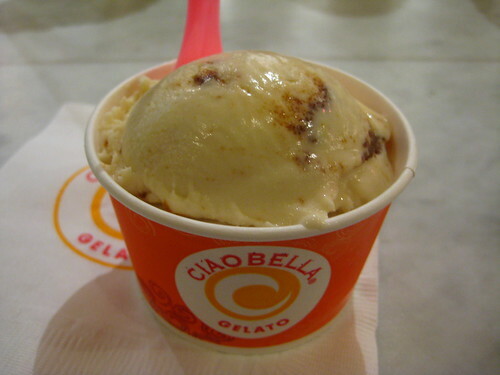 There’s a LOT of gelato in our area uptown and downtown, but Ciao Bella stills stands out in my book. The sheer number of flavors are guaranteed to make anyone happy, and they have the experience necessary to whip up some pretty great gelato. Before you knock the Sbarro’s, I’m pretty certain this counter is maintained by an outside company. 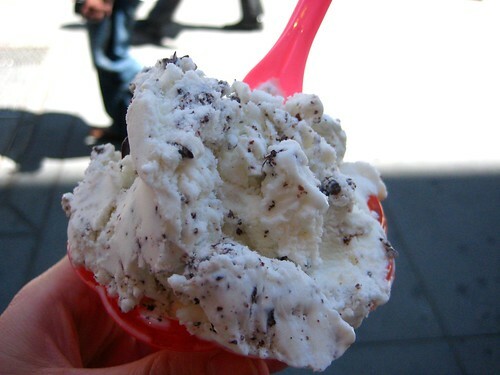 The gelato was decent, but the amount you get for the price makes this completely worthwhile. This Belgian chocolate shop, which has some pricey but pretty fantastic chocolate, has a small selection of flavors from Taste Gelato Artigianale. This is definitely the place for the gelato snobs out there, or for the rest of us when we feel like splurging. Oh yes, Previti Pizza made the best decision ever and is bringing in Italian Ices from Lemon Ice King of Corona. I grew up eating Lemon Ice King and it still has a high place in my heart. The ice is smooth and its evenly flavored throughout. 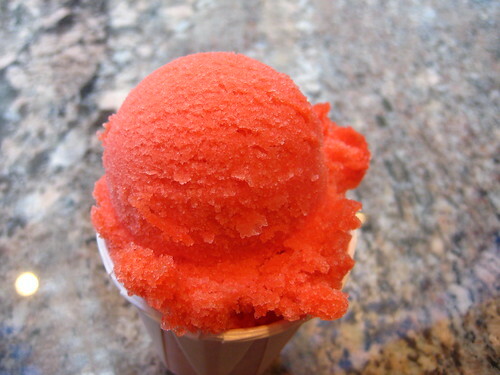 Previti is now one of the few places to get Italian Ice. Financier is another vendor that’s not stingy on the serving. 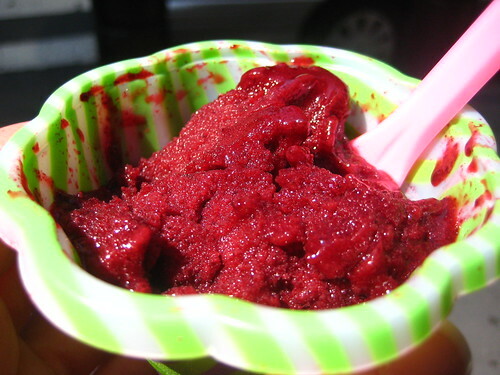 This is the small blackberry sorbetto, and it was awesome. Smooth, flavor-full, and refreshing, but not too sweet. 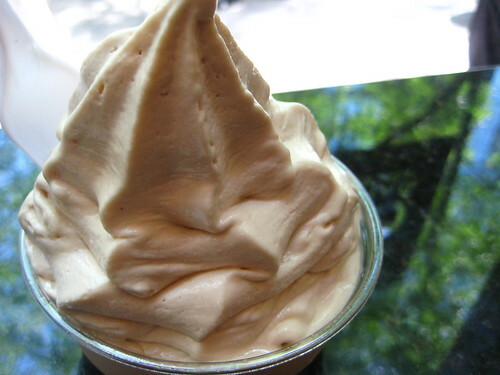 Besides gelato, we have a lot of frozen yogurt around too and it simply doesn’t get any better than 40 Carrots. Just the right temperature, price, amount, and a rotating list of flavors. Everything about their fro-yo is perfect-enough so that I’m convinced there’s something up. 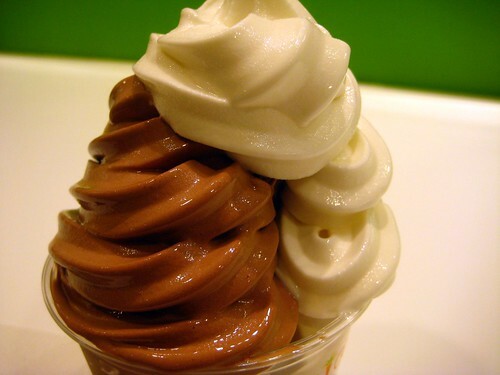 Oren’s frozen yogurt is supplied by the same company as 40 Carrots, so you can expect to see some of the same flavors. One thing they do have that you can’t get at 40 Carrots is some great coffee, or cookies should you feel the need to make a cookie sandwich. 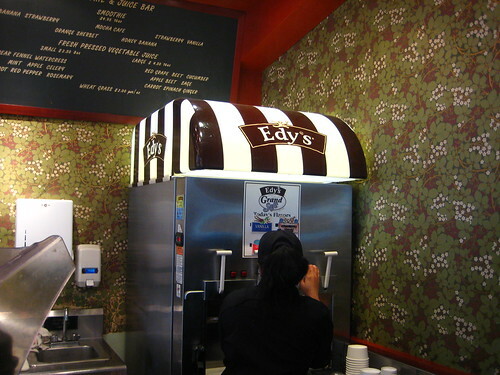 When I first spotted this Devon & Blakely’s Edy’s soft serve machine, I was psyched! But repeated efforts to enjoy any deliciousness from this machine were thwarted. It’s not pretty or delicious or worth your time & energy to stop here for summertime refreshment. Posted by Blondie at 9:30 am, June 7th, 2010 under Sweets. I used to be an avid 40 carrots supporter but at that price point my loyalty has moved 3 blocks up Lexington avenue to Berrywild. For $6, their “Wild Thing” special gets you a medium with 3 toppings. Adding a single topping to the small at 40 carrots puts you pretty much at the same price….and really, if I’m spending $6, I want cinnamon toast crunch, banana and honey on my frozen yogurt. To me, McDonald sundae is the best tasting and it’s SO Cheap at $1.29 including syrup of your choice(strawberry or chocolate) and peanuts. Nice, the first one looks like a Rainbow Cookie flavor. And 40 Carrots is good fro-yo. Their toppings offerings are decent too. At the risk of coming off as a curmudgeon, can we please stop using the “word” melty so much? Would you rather I use “goolicious”? Melt gelato on 2nd b/w 55th & 56th…haven’t been there in a while, but as temperatures rise, so will my rate of ice cream lunches. Golosi, Pizza and very good gelato, on park ave between 42nd and 43rd (east side of street) def. deserves a mention. It’s nowhere near Ciao Bella quality, but it is a personal favorite of mine. Papa Perrone serves pretty good-sized portions of Uncle Louie G’s Italian ices, and usually has 2 of my favorite flavors–spumoni and cannoli. Hey, Blondie – I totally trust that the Italian Cookie Ice Cream is awesome, and I’ll probably run over there and get some on a well-deserving day, but you have to admit, that scoop is pretty damn ugly. Heh he. The picture totally doesn’t do Taste Gelato justice. I typically get their medium in a hand-made waffle cone for $8.50. You can put up to three different flavors for a medium. I just love their sorbetto, the flavors are from fruits seasonal available and super yummy. A taste adventure for every sorbetto lover. I don’t think I am a snob … certainly not a Gelato snob but Borne Confection has the best Gelato in NYC. Not only is the Gelato delicous, it is all natural. I had the Cappachino last week and it was scrumptous! It is the closest to what I found in Italy. Since you mentioned Ciao Bella’s, while they do have lots of flavours, their product is extraordinarily over sweetened. If you like Gelato or ice cream a trip to Borne Confection is worth it! 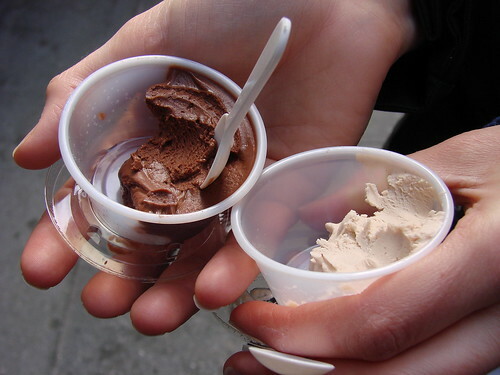 And did you know – Gelato has less caleries than ice cream … maybe we can call it a healthy alternative?! 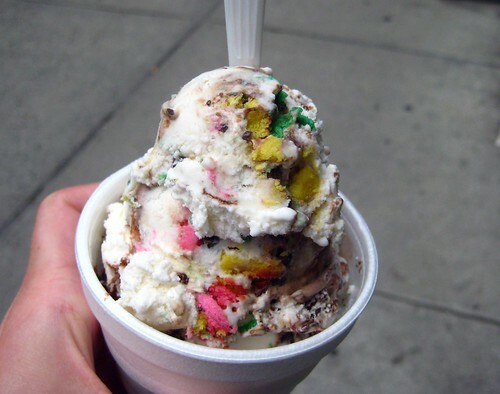 This post HAS to be by Blondie and Brownie, who in my opinion, take the best darn pictures of ice cream in the blog-o-sphere, if that is not a totally antiquated term by now. I always use your photos (with credit) on the Dollhouse blog. That Italian ice cream is insane. HOW do you find these things? And how are you not 300 pounds each?